Pacific Summit Energy develops long-term relationships and win-win transactions for our partners. Our experts have managed large energy portfolios for decades and know how to add value in the retail and wholesale energy markets. 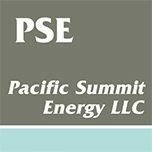 As a natural gas, power and crude oil marketing and trading company, Pacific Summit Energy is active in dozens of physical and financial energy markets in North America. As a natural gas, power and crude oil marketing and trading company, Pacific Summit Energy is active in dozens of financial and physical energy markets in North America. Pacific Summit Energy has a history of structuring complex projects that combine industry knowledge and innovation. © 2019 Pacific Summit Energy LLC.